Colette McGruder making impact in Los Angeles! Colette McGruder (left) with prize winner at chess festival. Colette McGruder has been one of the strongest Black female players in the world for decades. She was the first African-American woman to win the Region XI Women's Chess Championship (Menlo Park), winning it twice in 2000 and 2001. McGruder also earned her "Candidate Master's" rating and trained with the likes of Jeremy Silman. She also served as a mentor to another female historic figure… Baraka Shabazz. When Shabazz was blazing the trail as a teenage phenom, McGruder befriended her. Both were on the list for top female players during the 80s. However, Shabazz gave up chess and 40-60 hour work commitments limited the time McGruder had to compete. 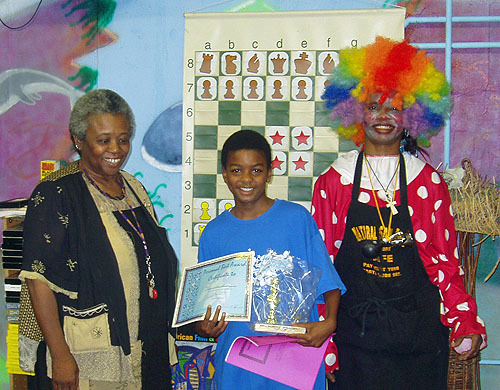 Having recently retired, McGruder has been increasing her chess involvement… particularly on the scholastic level. She is involved with the Paul Morphy Chess Club and sponsors scholastics tournaments and encourages your support! Tournament begins promptly at 10:00 a.m.